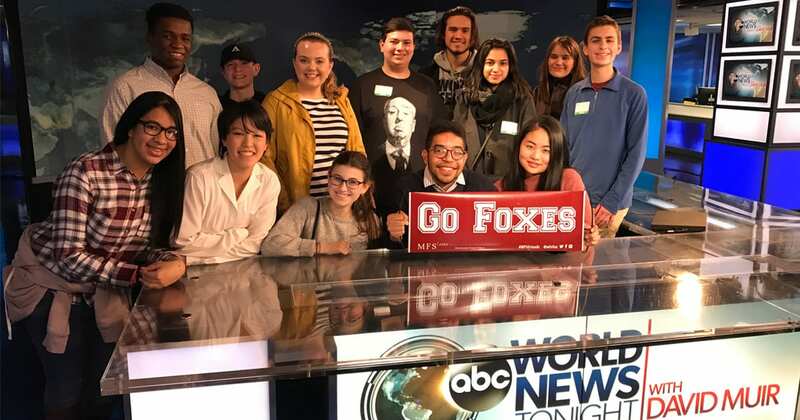 Journalists and advisors from WordsWorth, the MFS Upper School student news network, traveled to New York City on January 29. Andrew Rowan ’19 reports on the day’s events in this multimedia feature. WordsWorth staff members were guests of correspondent Linsey Davis ’95. For the first hour of the broadcast, WordsWorth got to sit in the corner of the studio to see how it was all put together. “At GMA, it was really cool to see all the technology and coordination that goes on behind the scenes for live TV reporting. You never get to see that when you watch,” said Miles Oglesby ‘20. The GMA crew shifted our group around the studio as they used various parts of the sets for segments. During some of the commercial breaks, anchors Robin Roberts and Michael Strahan met with us and talked about our work on WordsWorth and our aspirations for the future. For the 8 a.m. hour, we joined the rest of the general public upstairs in the studio audience. Many of WordsWorth’s staff made appearances on air! I was struck by how WordsWorth uses some of the same techniques that Good Morning America uses. On GMA, they hold up a cardboard sign so the reporter knows how much time they have left in the interview. This is the exact same thing that WordsWorth does in our “FoxTracks” video interview lounge. As we grabbed our bags, we were in shock by the realization that it was only 9:15 in the morning! After a quick, mid-morning snack at the ABC Starbucks, the WordsWorth crew headed to the 20/20 floor of ABC News World Headquarters, where we met with MFS trustee Janice Johnston ‘88 and Austin Harris ‘13, who both work on ABC News magazines and specials. They talked with students about how to break into the news industry and gave advice on internships and opportunities for us in college. They encouraged us to think about our network and ways we can expand it. While our MFS and college networks will be strong, they said, don’t discredit parents of friends or neighbors. After our interesting discussion, Austin Harris began to give us a tour of the rest of the building, complete with plenty of photos behind the World News Tonight desk, which is in the same studio where This Week ABC, Good Morning America Weekend, and America This Morning are filmed. Brand Marketing and Awards Manager Laura Vigilante was our host at CNN, and WordsWorth staffers toured the entire New York newsroom. Laura showed us the CNN Digital team monitoring analytics on every story on CNN.com. The team sat in front of giant monitors that displayed conversation bubbles, circles with news topics in them that got larger or smaller depending on how many people were talking about them, social media chatter, and page views for stories on CNN.com and its competitors. WordsWorth staffers also were shown the various offices and bureaus around the building. It was interesting to see both the intense individual focus and the collaboration between journalists. Reporter Mark Morales, who covers law enforcement, joined us in CNN’s flagship Studio 71. He talked with us about the importance of being sensitive with sources and the unpredictable schedule of journalists, as well as how to best understand what angle of a story will be best for your audience. 1:45 p.m. – Lunch Break! Many of us had already been awake for more than 10 hours, and we were starving! Our last stop of the day was Instagram’s New York offices, where we met with Dan Shinaberry, Data Communications Manager at Instagram and Facebook. Shinaberry is part of the team that releases data on what people were talking about during live television events, holidays, and more. He takes the analytics from Facebook and Instagram and creates easy-to-read breakdowns for media outlets. WordsWorth staffers were treated to gelato, which is always available (among other food items) to Instagram and Facebook employees. Shinaberry also gave students advice about the news organization’s newly created Instagram account. After another train and bus ride, it was the end of an enlightening day about the news and media businesses. This was a field trip none of us will ever forget.